Thanks to DigitalRoom.com I am able to offer 1 lucky winner a set of 50 custom Thank You cards. Digital Room offers cards that are made from high-quality paper and cardstock and with the holiday season around the corner these thank you cards will surely bring holiday cheer to your friends and family. 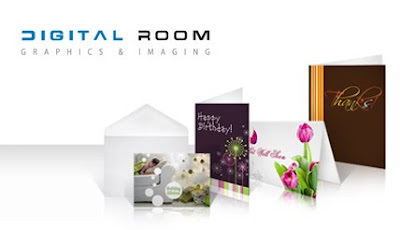 Besides thank you cards DigitalRoom.com offers cards that you can customize for fit any need, from Greeting cards, business cards and more ! Want to see what people are saying ? Check out some customer reviews in Yelp.com HERE! Eligibility: Limited to US Residents. Let us know how you plan to use the custom thank you cards if you win. Enter the DigitalRoom giveaway at Get Along Home, then come back here and let me know you did in a separate comment. One winner will be chosen ! I will be using a random number generator to select the winner. Contest ends at 11:59pm CST on 11/19/09. If the prize is not claimed in 48 hours a new winner will be chosen.Contest open to U.S. residents only. I'm having a baby in 4 days so I just had a bunch of baby showers that I need to write thank you notes for! This would be perfect!!! I would love to have thank you's printed that my children can use to send thank you's for gifts that they receive throughout the year. THanks so much. I use a lot of thank you notes throughout the year to thank people who have done nice things for my family. I always send a thank you for birthday presents. i will use these thank you notes for part of my sisters christmas present because she is always writing thank you cards to people. I plan to use the Thank You Cards for the friends and family that give me gifts or think of me around the holidays! The entire family will use them to thank people for gifts thru out the year. My dd 3's bday is in less than a month - these would be perfect! I would get them kid themed so my child can give them when he gets presents or someone does something nice for him! I'd definitely use these for thanking everyone for my Christmas gifts! I plan on customizing with a picture of my son, I have lots of funny pics of him, and then using as a thank you for his birthday gifts! My husband just opened a new business and I'd love to use these to thank everyone who helped get it going! I'd love to make photo cards for gifts. Thanks for the giveaway! I use them for my daughters Teachers, coaches etc.. Thanks so much for the chance. I would use the cards as Christmas Cards! I would ue these for after the holidays as thank you cards for everyone. I would use them to send thank yous to people after Christmas! Thanks for the contest! We'd use them after my son's next birthday party. Thanks for the chance! I'd use them for my twin sons' after their graduation party in the spring. These would be great for my kids to use when they get gifts. I'll send them to people I've received a gift from. I'd love to have thank you notes to use to thank people for gifts I get. i follow you & Uprinting on twitter - js22222222 . I would give the custom thank you cards to my niece as a Christmas gift. She has an unusual first name & has difficulty finding nice personalized items. These would go to all the students who bring gifts to school. That's a hint, kids!